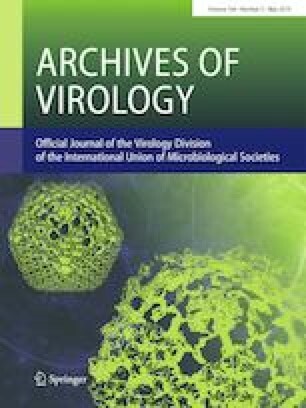 A novel ssRNA (+) virus with molecular properties typical of members of the genus Vitivirus (family Betaflexiviridae; subfamily Trivirinae) was discovered by high-throughput sequencing in samples of the American hybrid bunch grape cultivar Blanc du Bois in Texas. The results were independently confirmed by Sanger sequencing of the virus isolate, whose genome length is 7,387 nt, excluding the polyA tail. The genome sequence contains five ORFs that are homologous and phylogenetically related to ORFs of grapevine-infecting vitiviruses. The name “grapevine virus M” is proposed for this new virus, whose sequence divergence exceeds the current ICTV species demarcation threshold for the genus Vitivirus. Handling Editor: Ioannis E. Tzanetakis. The authors acknowledge funding support from the Texas Wine Grape Growers Association through Senate Bill 881 (SB881). We thank an anonymous grower for his cooperation and access to the Blanc Du Bois vineyard. We thank Mr. Jonathan Motloch, Ms. Regina Hernanadez and Ms. Cecilia Villegas (Texas A&M University System) for help with sample processing, and Dr. Minsook Hwang and Dr. Kristian Stevens (UC Davis Foundation Plant Services) for help with HTS library preparation and bioinformatics analysis. All the authors declare no conflict of interest. The funders had no role in the design of the study, collection, analysis, or interpretation of data, in the writing of the manuscript, or in the decision to publish the results.